Am always available for story-requests! I had an older twin brother called Chris, on rare occasions I will allow him to be a character (ghost or human) for other stories. So basically one-half of a twin duo. My favourite anime at the moment is "Cells at Work!" If you need to contact me, please use the PM system. Pred or Prey: Can play either way. I have a lot of medical conditions, which is how I got so good at biology since doctors are always seeing me regularly for checkups on my health... My many medical conditions include mild cerebral palsy, severe short-sightedness (-15), small lungs, mild hearing-loss, Asperger's Syndrome, lactose intolerance and slow digestion. Favourite art: Internal view/Stomach pictures. 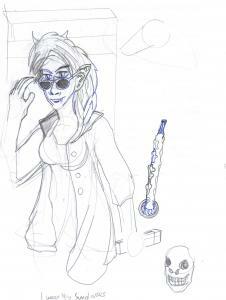 [*] A drawing of Misako in plant-form getting into a discarded shopping-mannequin while inside a broom-closet. Currently thinking of rereading a Goosebumps book called "The Blob that ate everyone!" Olapen wishes everyone a happy Valentine's Day for this year! I have some art requests for now (non-vore related) Please enquire for more. Wow, some of your stuff is pretty dark ... I like it! Halloween challenge: Write or draw the scariest story about my characters. I'm willing to have a story request by Halloween! I've been suffering from a cold lately so anything that takes my mind off my own illness is greatly appreciated! Page generated in 27.225 miliseconds. 27 Queries.